In my previous post, namely Prosody: Guide for the Beginners, we have got a small reference about what syllable is among many other prosodic terms. Today, I am going to keep lens on Syllable so that you may get a broader vision about the ins and outs of it. A syllable is a unit of pronunciation. It is a sound or combination of sounds produced at a single impulse of the voice. Its utterance is of course done by the vocal organs with a single push of air pressure from the lungs. Syllables are divided by the hyphen (-) sign. The number of syllables that you hear when you pronounce a word is the same as the number of vowels sounds heard. 3. 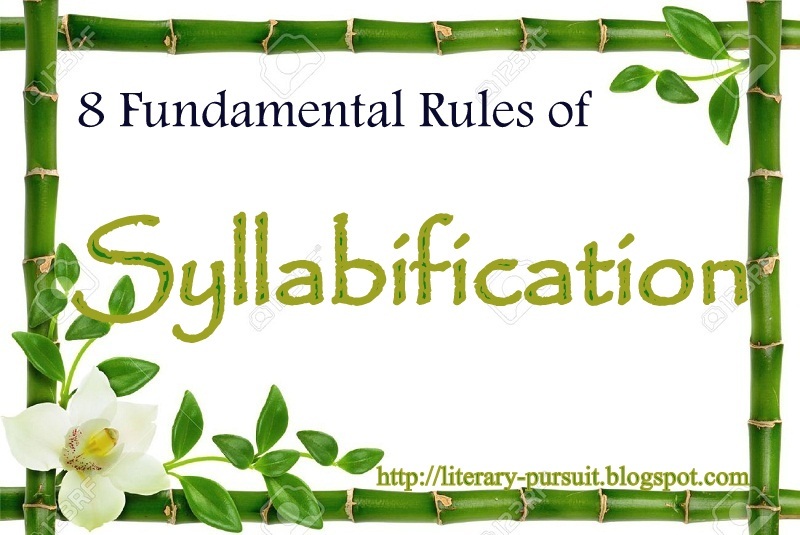 In words ending in double consonants, the consonant should not be separated in syllabifying their derivatives – fall, fall-en; miss, miss-ing; pass, pass-ive. Such as fam-il-iar, po-ten-tial, re-gion, o-cean etc. 5. Divide between two middle consonants. 6. Usually divide before a single middle consonant. 7. Divide before the consonant before an "-le" syllable. 8. Divide off any compound words, prefixes, suffixes and roots which have vowel sounds. 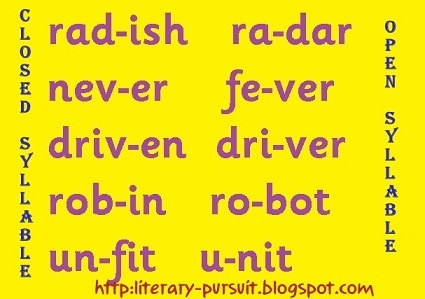 Split off the parts of compound words like "sports-car" and "house-boat". Divide off prefixes such at "un-happy", "pre-paid", or "re-write". Also divide off suffixes as in the words "farm-er", "teach-er", "hope-less" and "care-ful". In the word "stop-ping", the suffix is actually "-ping" because this word follows the rule that when you add "-ing" to a word with one syllable, you double the last consonant and add the "-ing". For example ‘even’ is syllabified as either ‘e-ven’ or ‘ev-en’. In the same way ‘anklet’ is divided as either ‘ank-let’ or ‘an-klet’. My suggestion would go surely for an Authentic Dictionary to get out of this trouble. What is Johnsonese? Give Examples.